INGLEWOOD, Calif. -- Anyone for Manny Pacquiao-Juan Manuel Marquez V? That is the fight likely to happen in the fall after Marquez put on a clinic against Mike Alvarado and won a lopsided unanimous decision in a welterweight title elimination bout before a raucous pro-Marquez crowd of 12,090 on Saturday night. It was the first fight at the refurbished Forum, which had not hosted a boxing card since 2001. The resounding victory, one in which Marquez did have to survive a knockdown in the ninth round, made Marquez the mandatory challenger for Pacquiao, who regained his welterweight world title by outpointing Timothy Bradley Jr. in their April 12 rematch. The judges had it 119-109, 117-109, 117-109 for Marquez. ESPN.com also had it 117-109 for Marquez, who dropped Alvarado in the eighth round. Making the win even sweeter for Marquez was the fact that it took place at the Forum, where, as an unknown, he cut his teeth and developed into a featherweight contender, going 12-0 with nine knockouts in the arena between 1995 and 1999. "I said it was going to be a tough fight and I said it was going to be a difficult fight," Marquez said. "I wanted to give the public here a gift. A gift that dignifies the history of this event and the history of the Forum. "I wanted to make this fight a gift to the fans." Another gift might be a fifth fight with Pacquiao. He and Marquez have already met four times in all-time great fights. Although Pacquiao leads the series 2-1-1, Marquez's lone victory was as definitive as the others were controversial. In their fourth fight, in December 2012, Marquez knocked Pacquiao unconscious with a right hand at the end of the sixth round for one of the most memorable knockouts in boxing history. Although Marquez (56-7-1, 40 KOs) lost his next fight by split decision challenging then-titleholder Bradley in October, he bounced back in a big way against Alvarado, the former junior welterweight titlist. But he was not going to make a definitive statement about fighting Pacquiao next right after the fight. "Finally, in that fourth Pacquiao fight, we obtained justice," he said. "This fight is for all of the Mexicans that have supported me in that fourth fight and this fight was for them. As for a fifth fight with Pacquiao, we'll relax. I don't know at the moment but any decision we make will be good for me, good for my family and good for the Mexican fans. "I'm not making a decision on Pacquiao right now. I felt great in the fight and I know I did a great job, but let me see how I feel in a couple of weeks. I am not making a decision on a Pacquiao fight right away. I'm gonna rest and think about it." While the crowd chanted "Marquez! Marquez! Marquez!" during the first round, he was firing punches, but Alvarado started very slowly. Alvarado was barely throwing any punches in the early rounds and anything he did throw Marquez countered well. The 40-year-old Marquez, a shoe-in Hall of Famer and one of the best fighters in Mexican history, raised swelling around Alvarado's right eye in the third round as he continued to land hard, clean jabs. 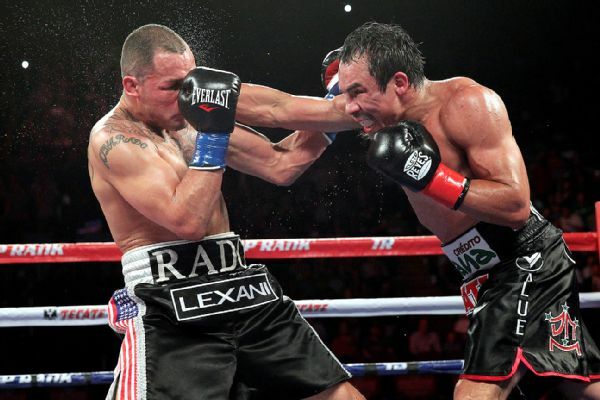 Chris Farina/Top Rank Juan Manuel Marquez won a lopsided unanimous decision over Mike Alvarado. Is a rematch with Manny Pacquiao next? Marquez, who earned $1.4 million, also had his right hand working well as he was aggressive with it against an Alvarado (34-3, 23 KOs), 33, of Denver, who appeared confused and was either unable or unwilling to throw many punches until turning things around later in the bout. Marquez continued to land powerful punches in the sixth round as the right side of Alvarado's face began to become more and more swollen. There was an exciting exchange at the end of the round but Marquez clearly got the better of it. Even when Alvarado, who made $650,000, did land anything, Marquez, one of the great counter punchers in boxing history, countered him. But the fight became more exciting in the second half even though Marquez was in control. He was having another dominating round in the eighth when he landed a huge right hand flush on Alvarado's jaw a couple of seconds before the round ended and Alvarado went down. He beat the count and the round ended. "It was a bad experience being in there with a legend," Alvarado said. "I was warming up a little bit too much before I started getting off. It was on me but it was a great fight. "I knew I needed to let my hands go to create some more shots for me. The way the fight went, he backed up and he felt the power from me so he fought a good fight." Moments into the ninth round, Alvarado landed a clean right that dropped Marquez, nearly silencing the crowd. But he got up, did not appear badly hurt and engaged Alvarado in an action-packed exchange that brought the crowd to life again. "That's the kind of fighter I am. I like wars," Alvarado said. "That's how he exploited me and that's how I fight. My hat's off to him. I thank God it was a good fight. I am happy with this opportunity and blessed that we are safe and it's good." Alvarado's left eye was also damaged and a purple mess after the ninth round and the ringside doctor gave it a good look, but the fight went on. After the 10th round, Alvarado's corner told him he needed a knockout. Alvarado landed a right hand near the end of the 11th round that nearly made Marquez's legs buckle, and he nearly went down. "Yes, I did expect this fight," Marquez said. "I always said that Mike Alvarado is a strong man and fast and worthy and strong, and I did expect this fight." Marquez's dominance was illustrated by the CompuBox punch statistics. He landed 278 of 627 punches (44 percent) while Alvarado landed 178 of 510 blows (35 percent). More notable, Marquez landed more punches than Alvarado in 11 of the 12 rounds. Alvarado has now lost two fights in a row. In October, in his hometown, he lost his junior welterweight belt in his first defense, getting knocked down twice by Russian brawler Ruslan Provodnikov -- who was ringside Saturday -- before retiring on his stool after the 10th round of a punishing fight. "I put that Provodnikov fight behind me," Alvarado said. "It was another experience and another life lesson I have gone through. It only made me stronger. This fight will only make me better. I will learn from it and use it for the rest of my career." One of the reasons Marquez accepted the fight with Alvarado was because it was an eliminator for a welterweight title shot. Marquez has won world titles in four weight classes from featherweight to junior welterweight and wants to be the first Mexican to win titles in five divisions. That would mean a fight with Pacquiao if Marquez wants the title shot next. "Marquez said he would go back and consult with his team and analyze the fifth fight. That's a pretty good statement," said Top Rank chairman Bob Arum, who promotes Marquez and Pacquiao. "I'm fairly confident I'll make it. Manny wants the fight. So it's going to be up to Marquez. It really is. I think there's a lot of money in the fight. And this was a great fight tonight. "Mike has the guts of a lion. He stayed in there, he hurt Marquez pretty good but Marquez is Marquez. Marquez is a great fighter."